I love deviled eggs. I wish preparation time was quicker, but that makes these nutrient-dense appetizers even more special to eat! Or perhaps you could make an entire meal out of these beautiful eggs. I know my family has. There’s nothing quite like sitting down to a plate of fluffy, tangy deviled eggs. They are so filling and delicious! There are probably as many ways to make deviled eggs as there are stars in the sky (okay, maybe I’m exaggerating a little). This recipe has two parts: directions for homemade mayonnaise and directions for deviled eggs, both of which require eggs. You will want to have at least 2 dozen on hand for this recipe. The amount of mayonnaise needed depends on how much you like to use. I personally enjoy more mayonnaise. I usually prepare 2 mayonnaise batches for 1 dozen eggs. You may want to use less (or more!). 1. Separate the whites from the yolks (save the whites in a container) and put the yolks into the stick blender mixing container. 2. Add in the sea salt, coconut palm sugar, mustard, and lemon juice and use the stick blender to combine (should take about 2 minutes). 3. Add in some of the olive oil. You don’t have to do it drop by drop, but pour some in – maybe a tablespoon or more at a time and keep using the stick blender to emulsify each time you add. You should start seeing the recipe becoming emulsified. As you do this, continue adding more olive oil in a tablespoon or more at a time, depending on how quickly it emulsifies. The mixing process should take approximately 5 minutes or so, and then your mayo is ready to use. 1. Place eggs in a pan covered with filtered water. Cover with a lid and bring to a boil. Turn heat down and allow to simmer for 5-7 minutes. 2. Turn off heat. Remove eggs and drain. If desired, allow to cool before storage. 3. Place eggs in a bowl or other container in the refrigerator for at least 6 hours or overnight. When cooled, they are much easier to peel. 4. When eggs are ready, take them out of the refrigerator and peel. Cut each into halves lengthwise. 5. Carefully empty by squeezing and scooping gently the yolks from the whites into a bowl for mixing. Set aside all whites on a plate. 6. Mash yolks with a fork. 8. Mix all ingredients well with a fork. Scoop out the deviled egg ingredients and fill each empty egg white to the amount desired. Sprinkle additional paprika on top of the eggs for appearance (optional). Another option is to fill a pastry tool with the egg mixture and squeeze into the empty egg whites. I recommend this Norpro Cake decorating set via Amazon affiliation. Serve right away, or chill before serving, if desired. How do you make deviled eggs? I loved deviled eggs. I cannot wait for the day when my gut is healed enough for me to enjoy them again! Great recipe. Hi Jessica – I hope you heal quickly so you can enjoy them again too! I love me some deviled eggs. Now that we have our own chickens, it seems like they taste a million times better! I’d make deviled eggs if my husband wouldn’t finish a whole carton! Even if eggs are healthy, I think that’s a bit too much, don’t you think? I love this recipe! I’ll have to pin it to save it for when we have guests! Hi Karen – yes, they get eaten very quickly around here too! I understand that completely! And yes, it seems like a lot. I can only eat about 3 -4 at a time because they are REALLY filling! I love devil eggs. Love your recipe. So healthy. Oh yum! I love deviled eggs! I don’t make these often … I always forget. In fact I haven’t made them in years and my 2 year old has never had them. I bet she’d love them. Thanks for the inspiration. Going to have to make these soon. Looks tasty! I’ve actually never had deviled eggs – I used to hate yolks. Now that love them, I’ll have to try these. Hi Chloe – yes, great opportunity to try! I think you’ll love them! Thanks for the recipe, I’ll have to make these! My kids call them “Angel eggs” lol! Mmm, all that olive oil and the bit of mustard~ sounds delicious!!! I love deviled eggs too! Hi Megan – yes, they seem to be a favorite for many all around! The mustard and the lemon juice are two of my favorite parts! Do you mean 3 dozen eggs, not 3 eggs, in the list of ingredients? Hi Cari – no, to make the mayonnaise for the deviled eggs, the recipe calls for 3 eggs. 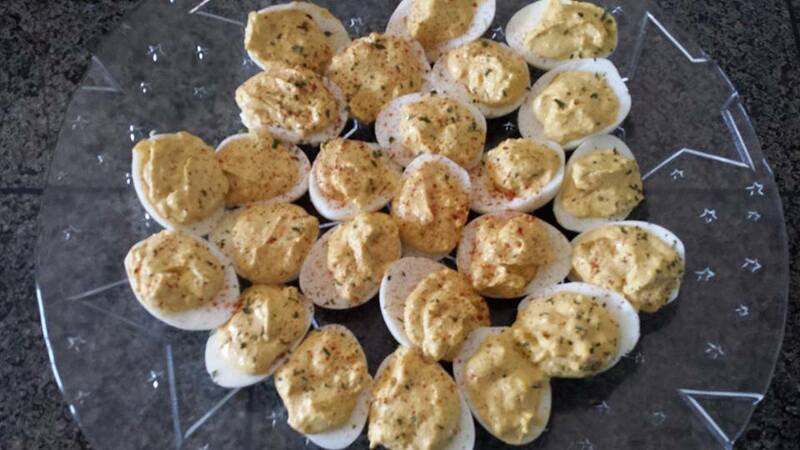 The “Deviled Eggs” part of the recipe mentions using 12 eggs.